There are a lot of dumb, pointless apps out there that make it hard to put our smartphones down. That's what makes Unicef's new project for World Water Month doubly brilliant—it raises funds to provide clean drinking water to needy kids, by encouraging smartphone users to take a break from the touchscreen. Sounds like a true win-win. 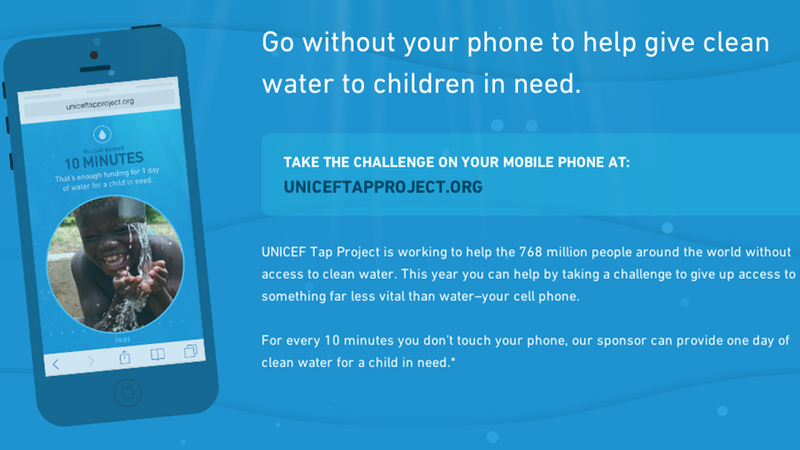 The Unicef Tap Project is a webpage that listens to the motion sensors in your smartphone. Once you've opened the page, it prompts you to put your smartphone down somewhere and ignore it. For every 10 minutes you don't touch your phone, Unicef's sponsor donates funding to provide one day's worth of clean drinking water to a child in need. Brian Moore and Johan Gerdin, creatives at at agency Droga5, created the app to show users how it feels when something we've come to consider a "necessity" is removed from our hands, even temporarily. "Putting yourself in the shoes of someone else is hard, especially when they're a child halfway across the globe," Gerdin told Co.Create. "Taking something away from yourself at the very least allows you to reflect." This simple little activity can teach you a lot—about how often you instinctively reach for your smartphone, and about the things you might be missing while you're tapping away at a touchscreen. The fact that this insight comes with a charitable contribution to help needy kids just makes it that much better. Update: Helpful reader AgentRockstar made this QR code that will send your device directly to the Unicef timer page. I'm not able to confirm it myself (for reasons we won't get in to (don't drop your devices in slushy winter puddles, kids)), but two readers confirm that it works. If that's convincing enough for you, scan away and get to phone-ignoring!